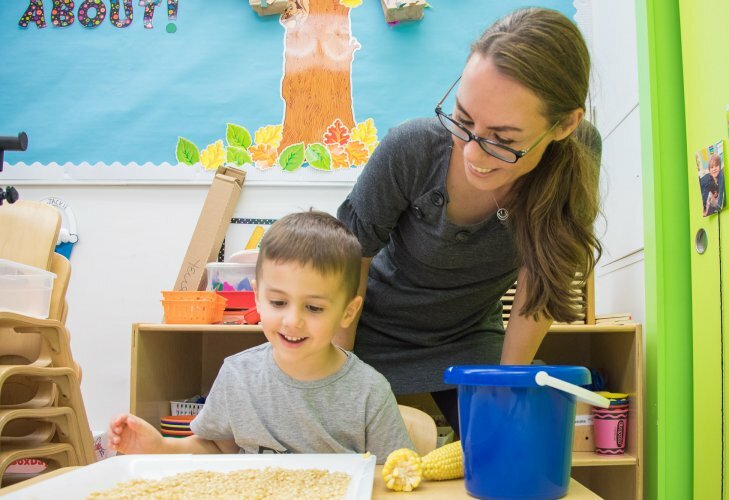 The development of language during the preschool years consists not simply of more words and longer sentences, but also of pragmatic skills that enable the child to communicate effectively and appropriately in a variety of social settings. Our classrooms afford children the opportunity to practice and expand upon their expressive and receptive language skills. Interactive circle times, pretend play, and development of the children’s individual interest allow for a language-rich curriculum model. Speaking, reading and writing are dynamically linked in children’s development. One of the most influential ways to assist this development is through meaningful instruction. Situations that surround children with opportunities to explore different forms of pre-literacy experiences are fun and engaging. Our teachers ensure that all aspects of the classroom are literacy rich. A literacy rich classroom is one that promotes interest in reading and writing but also encompasses areas of listening, speaking and viewing.